It’s inevitable that one day humanity is going to need to live somewhere other than Earth, and our first step towards intergalactic colonization will probably be the moon. The only problem? We’ve only visited it 12 times, and already there’s over 400,000 pounds of garbage up there. How did our nearest celestial neighbor already become a garbage dump? Sending spaceships and landing craft to and from the moon is expensive, and the more equipment we were able to leave on the lunar surface, the easier and cheaper it was to bring astronauts home after the Apollo missions. 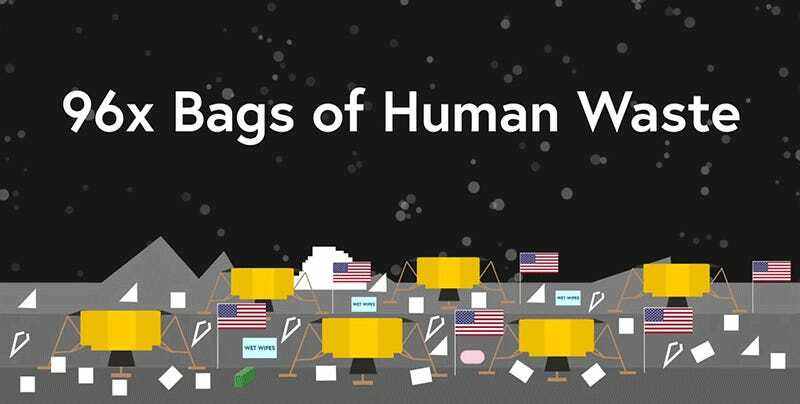 As YouTube’s Half as Interesting points out, each moon landing left behind a 22,700-pound Lunar Lander, plus a bunch of other crap the astronauts brought along, like golf balls, two-dollar bills, and their actual crap, in the form of giant bags of human waster that are still there waiting for the moon’s first settlers to arrive. Maybe we should list as a fixer-upper. Are you ready to move to the moon yet?